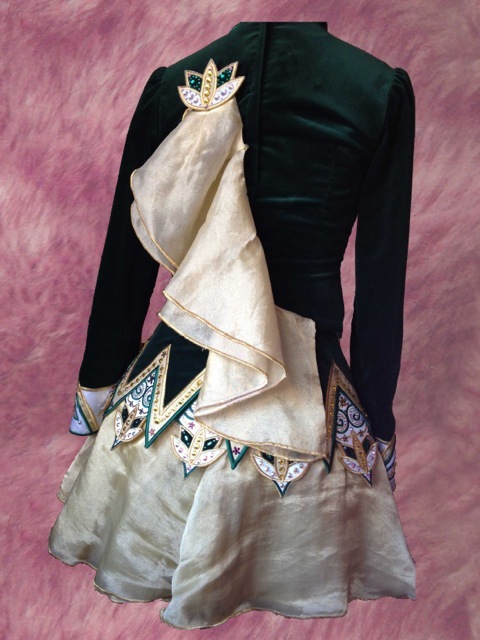 This dress features a gorgeous GOLD SILK ORGANZA soft skirt and a rich EMERALD GREEN bodice of high-quality 100% cotton velvet. 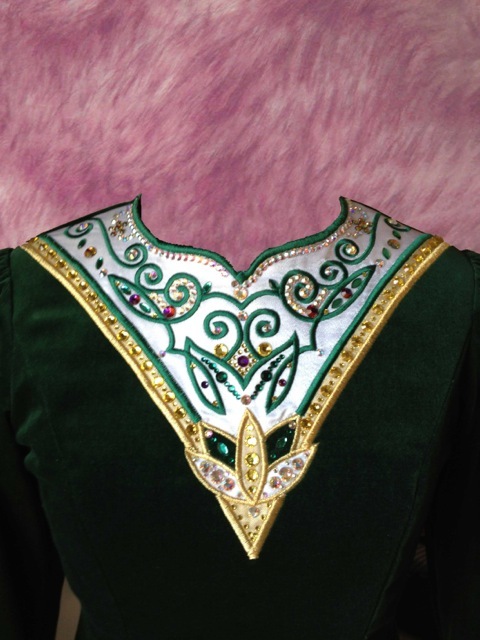 This dress has WONDERFUL STAGE PRESENCE and truly sparkles thanks to the 1000s of hand placed COLORED Swarovski crystals. 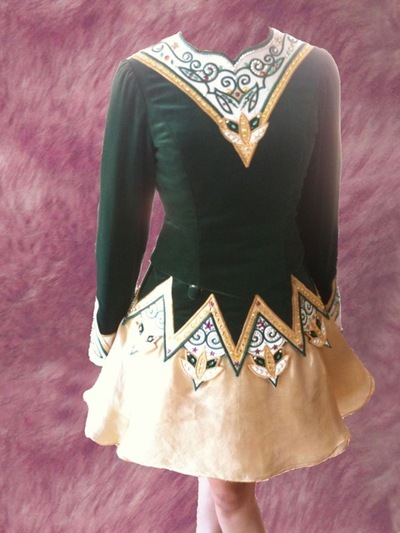 This dress would look good on any dancer. The back has a hidden zipper and a clever removable lotus “panel” for easy take-on and take-off. The cape has a lotus flower and is gold silk organza. There is NO VELCRO on this dress, only snaps, so the fabric is in IMMACULATE condition! The Shawl features a lotus flower on top and is Gold silk organza. There is LOTS of let out room and LOTS of luck in this dress! No sweat, stains, or other marks. 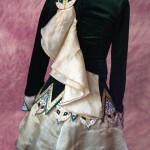 The silk skirt can be pressed and the velvet steamed cleaned. It has a removable lining on the jacket for easy cleaning. 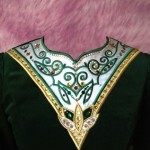 This dress can be worn ‘as is’ or with an included ‘tutu’ for a fuller look. The jacket has a removable cotton lining that can be washed. Their is let down or let out room. INCLUDES: headband, tutu, kick pants (NEW NEVER WORN), and Gold Jeweled socks (NEW never worn).. and LOTS of luck! The dancer won A LOT of Trophies in this dress – in fact she moved from her first dance in Novice Prelim in UNDER 1 yr 3 months in this dress! Asking Price: $US500 OBO. Shipping costs are included for my own country, overseas shipping is extra. Sale is final.